Eagle Industries Discreet Case is a low profile rifle case. 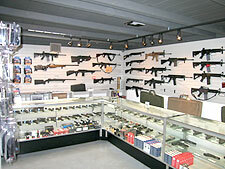 The Armory on Pima is Tucson’s premier source for handguns, tactical rifles, tactical shotguns and accessories. In addition to offering the most competitive prices in the country, Josh and his staff will provide you with expert advice and personal, professional service. We look forward to seeing you soon at The Armory on Pima, Tucson’s most exciting gun store! My experiences on this day with the magnifier showed me a few areas that I will need to work on to make fast accurate hits from certain positions. As I write this, I spent my day at the range shooting from 200 to 500 meters with a few different platforms/ optics combinations. My magnifier proved to be very beneficial to acquiring and hitting steel at the various distances. The 3X will help to acquire and identify targets at distance quicker, something that an Aimpoint alone makes a bit more difficult, however as is the case with most things in life, it has proven to not be perfect in every situation. I am willing to compromise a few very specific situations for the all around utility on the 3X magnifier on most of my carbines. I also have the option of flipping the QD lever on the LaRue mount and taking the magnifier completely off the rifle when need be. We took two Short Barrel Rifles to the range to run some drills. The camo AR is a Bravo Company Manufacturing 11.5 inch upper on a RRA SBR lower. It features an Aimpoint T1 in a LaRue Tactical Mount, Troy rear sight, Surefire Flash Hider, LMT SOPMOD Stock, Tango Down Battle Grip, Stubby Vertical Grip, Rail Panels, and PR-4 Sling Mount, LaRue Tactical 7.0 Forend, Viking Tactics V-Tac MKII Sling, Light Mount and Surefire G2 with Cree Q5 LED Upgrade, as well as a Surefire FA-556 212 Suppressor. HB 2474 passed out of the House “Third Read” on Wednesday, May 13, 2009, by a vote of 41-10 with 9 members not voting. From here HB 2474 will be transmitted to the Senate. HB 2474 stipulates that property owners, tenants, public or private employers, and business entities must not prohibit the transport or storage of legally owned firearms in locked and privately owned motor vehicles parked within parking lots, parking garages, and other designated parking areas. It exempts property owners, tenants, public or private employers, business entities, and their employees or agents from civil liability for damages resulting from or arising out of an act involving a legally owned firearm that is transported or stored within a locked and privately owned vehicle. It allows employers and business entities to prescribe policies mandating that owners keep firearms out of the plain view of the public when stored or transported in locked and privately owned vehicles. And, it specifies inapplicability stemming from state and federal prohibition, and motor vehicle ownership. These alerts are a project of the Arizona Citizens Defense League (AzCDL), an all volunteer, non-profit, non-partisan grassroots organization.